Kind of like chocolate and peanut butter! Previously, installing and using React.js on a Phoenix application required ripping out brunch and replacing it with something like Webpack to get everything working, but the process has been improved significantly with the introduction of Phoenix v1.1.2 which includes a new version of Brunch that works with npm. 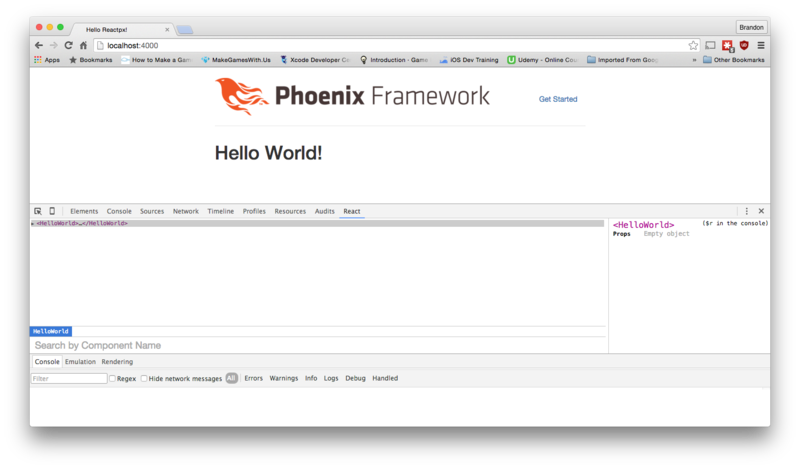 We’ll walk through creating a new project using Phoenix v1.1.2 and getting a basic React component working and rendering on our main page. We’ll start by creating our Phoenix project before we do anything else. This will require us having Phoenix v1.1.2+ installed via local hex before anything else. Go ahead and answer yes to fetching/installing dependencies. We’ll be needing them this time! Now, move into that directory and we’ll move on to installing our NPM dependencies. // Whitelist the npm deps to be pulled in as front-end assets. // All other deps in package.json will be excluded from the bundle. This tutorial assumes you are using NPM 3.x. If you’re using NPM 2.x you’re going to hit issues attempting to build everything together, as has been suggested by a few people. For more information, please reference https://github.com/phoenixframework/phoenix/issues/1410#issuecomment-166001866. Special thanks to Matt Widmann and Fabio Akita for pointing this out!